I'm not supposed to be making cards.....but I can't help myself lol! 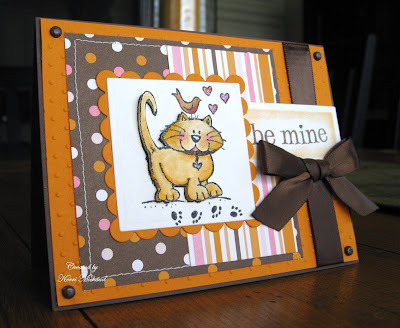 I just took a peek at today's sketch challenge, then I looked at the gallery~just a peek, then I got the creative urge, and before you know it, I made a card hehe: ) I think I will give this one to my husband for valentine's day. It has a bit of a masculine edge with the orange and brown don't you think? I used this cute image from Great Impressions, stamped it twice, cut out the kitten and popped him up on dimensionals. I watercolored her with Pumpkin Pie and added some Regal Rose to her cheeks, and hearts. I added a straight stitch to the polka dot panel, and ran the large orange panel through the CB Swiss Dots folder. The sentiment is from Verve's Hearts On Fire. Thanks for stopping by! This just the cutest Valentine and I think anyone would love it! What a great husband Valentine cards...great masculine/non-girly colors too! This is awesome!